YouTube seems to have fixed it so that when AdBlock is enabled, one can not access the "skip ad" option button. I can get this back by disabling AdBlock via the Safari > Preferences panel, but going in and out of that is a pain if I am switching between windows. Unless I am missing something and you already have this implemented, I recommend having an option that appears in the menu bar to quickly and temporarily disable AdBlock and then re-endable it as I navigate various windows and sites. Better yet would be to Figure out what Google is doing at YouTube to prevent its ads from hiding the "skip ad" button automatically. Provide a link to a video where you're seeing an ad you're unable to skip. Going to https://www.youtube.com/watch?v=eA4VdiyzQ-I&ab_channel=DroneCampsRC on YouTube (as well as many other places) with AdBlock tuned on, starts out with a video commercial that can not be disabled. Reloading the URL doesn’t help. In my case, I must watch a 2 minute 33 second “Toys R Us” commercial before the YouTube content starts. If I disable AdBlock, then reload the YouTube URL, I am now offered the option to click away the commercial after only a few seconds, as a “Skip ad” button appears in the lower right hand corner of the YouTube video window. 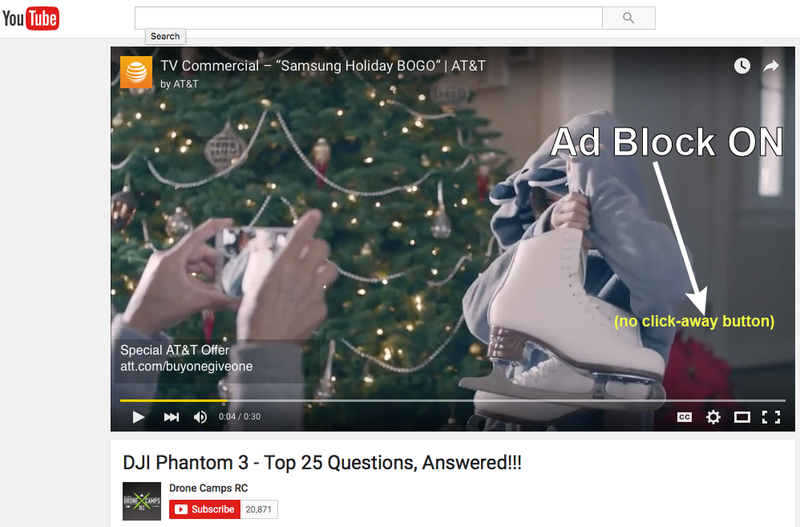 YouTube (Google) is apparently able to detect AdBlock and then hide the “Skip ad” button to force me to watch the commercial in its entirety if I have AdBlock enabled. Let's try a couple of things, OK? I tried everything that you suggested below, but nothing had any effect on the ads being thrown up by You Tube. 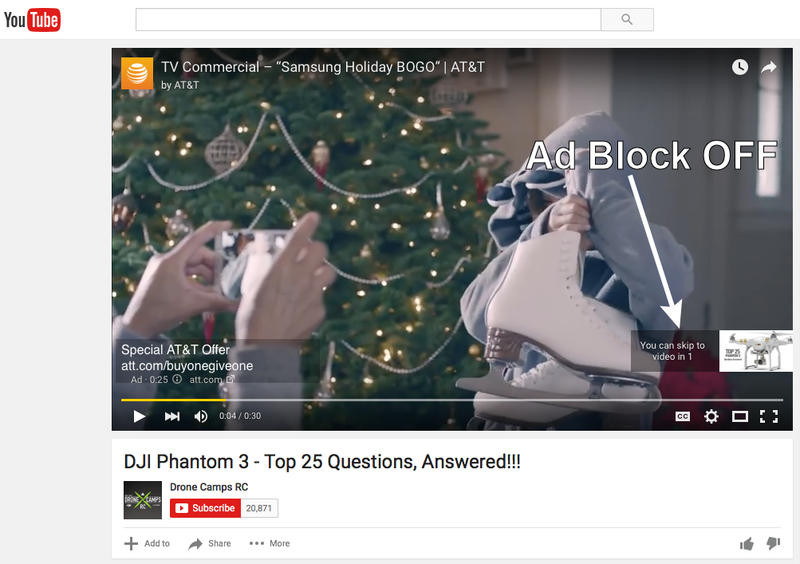 Only disabling Ad Block provides access to the “Skip Ad” button. I have attached two screen shots, the first one shows the same point (4 seconds into the ad that precedes the actual You Tube video content). Note that the ad begin served up with Ad Block ON, does not afford the option to click out of the ad. The ad with Ad Block OFF, allows a click-away button that times out in about 5 seconds. Please report this to the EasyList maintainers. You can find the contact info in our Knowledge Base. You'll need to click the New Topic button on the Report unblocked content page. Thanks! Please let us know if you don't hear back from them within a few days.